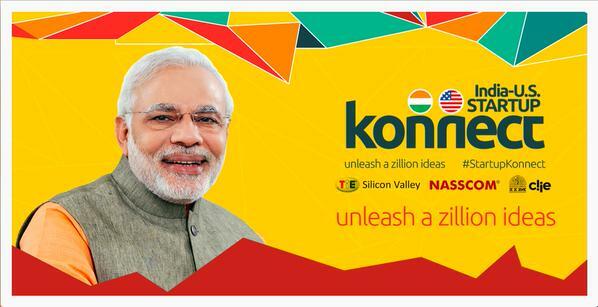 Home / Social Media / The India-US #StartupKonnect Experience with PM Modi. Unleash a zillion ideas. PM Modi recently visited Silicon Valley with an agenda to promote his futuristic goal of a Digital India. During his landmark visit, he attended the “India-US Startup Konnect 2015” exposition that displayed more than 35 Indian companies representing the strength of the Indian startup ecosystem, across a variety of industries including agriculture, healthcare, energy, finance, and biotechnology. Several leading technology incubators from India were also in attendance. The Prime Minister communicated a vision of “Start up India, Stand up India” and this day-long event on September 27, 2015 clearly followed his declaration. I was fortunate enough to be a part of this historical event, being the social media volunteer with “The Indus Entrepreneurs” Silicon Valley Chapter (#TiESV) and utilizing #NewzSocial, an innovative social media advocacy software platform. Prior to the event, the NewzSocial platform’s content discovery engine was utilized to disseminate articles on PM Modi’s upcoming visit via social media ambassadors. The TiE social media ambassadors were recruited to be part and parcel of the NewzSocial platform, to serve as advocates for the special event. They permitted NewzSocial to post content automatically, or after review, on their personal Facebook and LinkedIn timelines, as well as Twitter handles. Subsequently, the reach of the content was amplified with greater shares, likes, and retweets of posted content. Analytics were collected on each post, enabling the event orgaizers to get a clear idea of what pieces of content were most engaging in the social postings. During the Konnect event, NewzSocial broadcasted live tweets of the events as they unfolded. Rich images and video content were tweeted via the ambassadors to reach a broad audience. I was happy to live tweet some of the memorable moments that unfolded during the sessions. The event was hosted by #Nasscom ( the premier trade body and the chamber of commerce of the IT-BPO industries in India) in partnership with The Indus Entrepreneurs (TiE) and the Indian Institute of Management Ahmedabad’s (IIM-A) Centre for Innovation, Incubation and Entrepreneurship (CIIE). The hashtag for the event was #StartupKonnect and the tagline was “unleash a zillion ideas”. With the aim to create and provide support to disruptive start-ups, PM Narendra Modi announced the launch of the Bharat (translates to “India”) Fund (Better Health, Agriculture, Renewables and Technologies) during his keynote speech. The Bharat Fund will provide seed funding to Indian startups that promote social entrepreneurship in areas of health, energy, technology, and agriculture. Many of the Indian-American technology community leaders attended the event. There were notable speakers and panelists discussing the future of technology and India’s key role in pushing the boundaries, with its human capital, technology prowess, and leadership under the new government. Successful CEO’s from Indian startups- Snapdeal, InMobi, Zomato, and Paytm dubbed the “Indian unicorns” contributed to a lively panel discussion with moderator Ravi Gururaj, a serial entrepreneur and Nasscom executive. India’s Ministry of External Affairs (MEA) tweeted that #StartupKonnect is a catalyst for the future. “A girl child in a remote Indian village dreams of her own projects when she sees startups of today”. Reed Hoffman, Executive chairman and co-founder of LinkedIn, VC, and author was present on stage alongside PM Modi, displaying his support of the “Konnect” between US and India for technology partnership. “What the Prime Minister is doing in terms of ‘Digital India’ is great leadership,” he said.